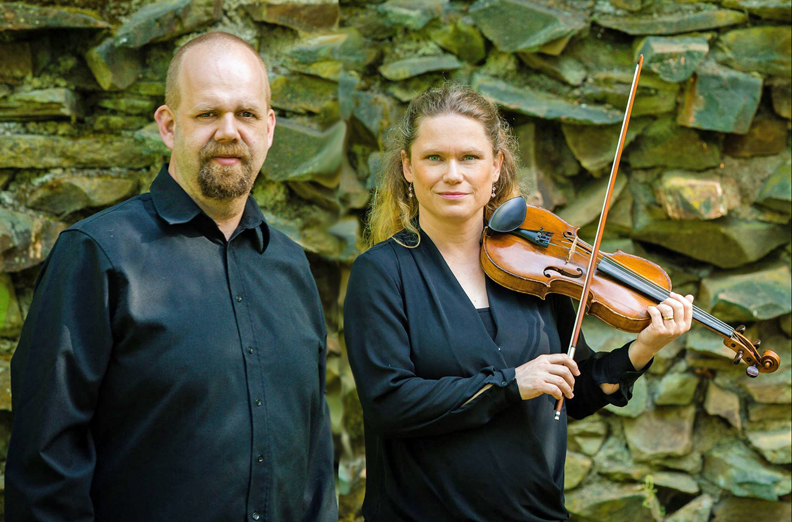 Anders and Maria Larsson play Swedish folk music of Skåne and Södermanland, the areas they grew up in, but also of Malung, Dalarna where they lived and taught for fifteen years. Anders and Maria have toured together in 25 countries from Kenya to Greece and frequently in Germany and Scotland. They are two of Sweden’s most established folk musicians and for many years operated their own record label and culture house in Malung, Sweden where Anders was a vocal coach at the renowned folk music education course at Malungs Folkhögskola. They have now relocated to Malmö in the south of Sweden where they are freelance musicians and teachers. Using traditional instruments such as nyckelharpa, härjedalspipa, fiddle and mandola the riksspelmna duo creates a genuine sound that is both new, modern and traditional at the same time. Maria Larsson plays fiddle, nyckelharpa, recorder, härjedalspipa, and also sings. She studied classical music and Swedish folk music at the Music Academy in Malmö, Lund University and at the Sibelius Academy in Helsinki, Finland. She has toured as a musician in many different countries, primarily in Sweden, Germany, Italy and the UK. She toured in southern Sweden with preschool shows entitled "Treasure Hunt" and "Grandpa and Maria celebrate Christmas" about 300 performances over two years. She started the Malung Cultural Center in Malung, Sweden and directed it for three years. She has released seven records with three different bands and is now working on an eighth album with Anders Larsson and Johannes Mayr. Anders Larsson plays guitar, bass, drums, trombone and tuba but his main instrument is voice. He studied Swedish folk music at the Music Academy in Malmö, Lund University and at the Sibelius Academy in Helsinki, Finland with a main focus on singing of traditional folk songs. For 25 years he has been working as a musician in a variety of contexts – various performance venues, on CD as well as on radio and television. He has been a guest teacher at the conservatories in Stockholm, Malmö and Arvika and a variety of folk high schools in Sweden. He was responsible for teaching folk singing at the Music Academy in Odense, Denmark for two years. From1999-2014 he worked as a vocal coach at Malung Folk High School-- one of Sweden's few schools where adults can study full-time folk music. In addition to teaching folk music Anders has also taught rock/pop ensemble playing. He started the label Nordic Tradition and has managed it since 2004 and been the primary recording engineer / producer. He has published 7 CDs and has been a studio/session musician on numerous other CDs including traditional Swedish folk music, progressive Swedish folk music and music for children.